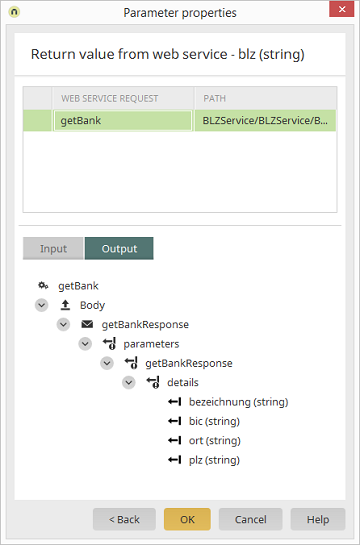 Processes module Web service action Properties "Web services" tab / Select a parameter / Select "Edit" from the context menu Parameter type / Return value from web service / Click on "Next"
Displays the name of the web service request. Displays the path in the WSDL structure. Here, all return values of the web service that has been selected in the upper area of the dialog will be shown. This means that return values from previously submitted calls can be selected as inputs as well. Input and output parameter types must correspond to one another. The priority of the requests, which controls their sequence, must be taken into account with the parameter type Return value from web service.